Imagine a survival RPG crafted on a shoestring budget by Terry Gilliam & Guillermo del Toro. If that sounds appealing, then Smoke and Sacrifice from indie outfit Solar Sail may be right up your (dark) alley. The story begins with protagonist Sachi in her rustic village; soon she realises that her son is the next in line to be sacrificed to the Sun Tree in a mysterious village ritual. Following the apparent death of her baby, the distraught mother makes her way to the eerie underworld in search of answers and hopefully her son. 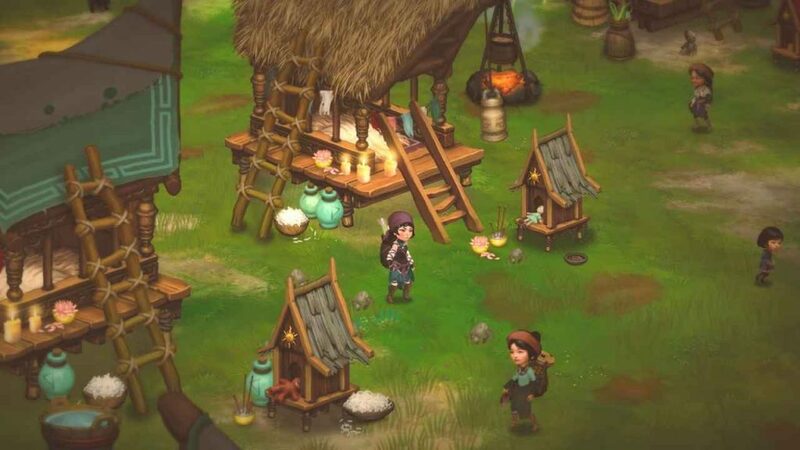 Via a fixed isometric view reminiscent of Don’t Starve and The Flame In The Flood, the quest begins in a murky wood where Sachi learns how to craft survival elements essential to protect her from the myriad of strange creatures, plants and the mysterious smoke permeating the landscape. 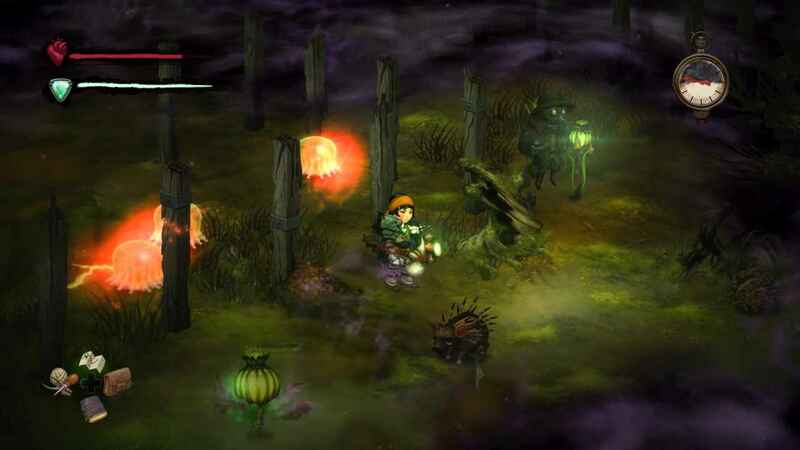 Lamps crafted from fireflies and glowferns fend off the debilitating smoke, and basic weapons are introduced as the story progresses. Crafting ingredients are dispensed through smashing crates, harvesting plants and looting dead creatures and it’s not long before your inventory begins to fill up with some of the 60+ items you can craft with. Certain items require you to visit Cookpots for combining edibles, the Workbench for weapons and industrial machinery for more complex items. As food ingredients degrade over time and clothes and weapons need repairing, much of your time will be spent monitoring your inventory levels and ensuring your prized weapon is maintained before it breaks and needs recrafting again from scratch. 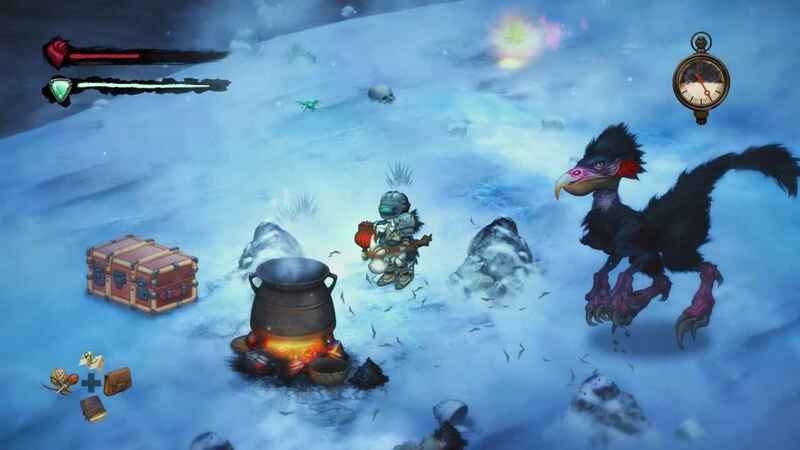 Throughout the journey across dark forests, icy tundras, electrified industrial zones, rickety villages and lava wastelands, your mission is constantly hampered by a swathe of hostile creatures. Monstrous Tyrannosaurus chickens, porcupines the size of elephants, a host of poisonous land jellyfish and many more abominations all vie to debilitate your health bar as you attempt to reach the next save point. The industrial zones ramp up the oppression by introducing robotic supervisors, electrified rats and giant Stokers reducing your character to hopping around like a lunatic in order to escape the bombardment. Fortunately there is occasional respite in the form of friendly NPCs who aid you on your journey dispensing blueprints and gifts whilst progressing the story through irreverent dialogue and guidance. The Drears are the most omnipresent – ghostly workers who float through the landscape like extras from a gothic take on Fungus the Bogeyman. Eerie Dickensian urchins inhabit the villages and industrial zones, hinting that perhaps Sachi’s child has somehow survived the apparent incineration at the beginning. After a good few boss fights, relentless foraging for supplies, and numerous trips around the map to complete side quests/craft items/open chests/reveal recipes, the mystery of the Sun Tree and the underworld begins to unfold. It starts to become apparent however, that this is game which requires the player to put in quite a bit of legwork and time to get anywhere near the denouement of the main story, let alone the time that it takes to complete the side missions. On one hand this offers the player great value, especially at this low price point, but after 4 or 5 hours it starts to feel like something of a slog due to the simplistic nature of the gameplay combined with the constant busy work involved in trying to stay alive. Initially, exploring the map and discovering new creatures and landscapes is highly absorbing. 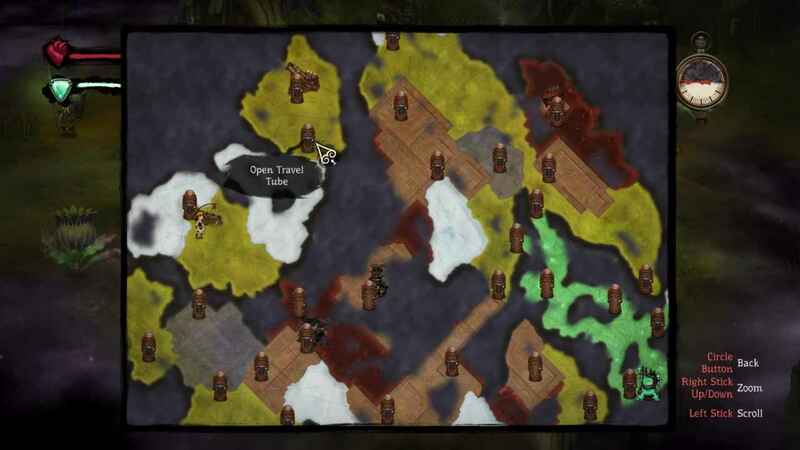 This begins to wane when you realise that the game world map repeats itself on a regular basis, and without a seamless flow between the different environs, it feels like there’s no design logic to the cut and paste environment. Visually, there is an abundance of creativity throughout the isometric 2.5D world – lovely character design evoking Manga and Raymond Briggs in equal measures, beautifully grimy Steampunk technology, and crisply detailed hand drawn fauna and flora. The fixed view camera occasionally obscures objects (particularly behind buildings) and there is a restricted view when your character moves down the screen which caused a few unnecessary injuries, so a movable camera would have been a boon but it’s not a major issue. The sound effects add a satisfying weight to destructive manoeuvres and wistful rustic ambient sounds give life to the villages and swamps, whilst a subtle score enhances the atmosphere dynamically during the story’s dramatic arc without being obtrusive. The village ritual scenes may have benefited from some traditional folk tunes in the vein of The Wicker Man. Overall, Smoke and Sacrifice is a well-crafted (pun intended) and highly challenging action adventure with a plethora of additional quests for those who are that way inclined. The story centred on maternal anxiety and the strong visual style adds a refreshing take to the genre. The experience could have been more enjoyable had more time been spent on honing the gameplay and making the landscape more cohesive and believable. Instead there is an overabundance of weapons, ingredients and crafting materials which rely on unintuitive and fiddly menus. 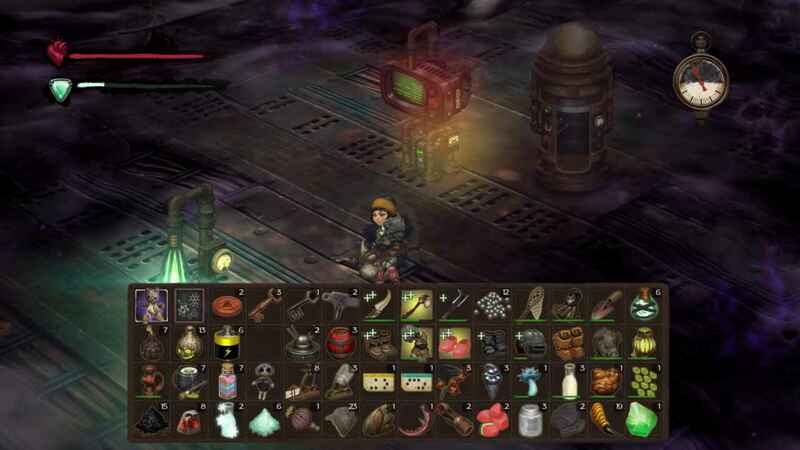 The constant stop/start of the inventory rummaging may be synonymous with RPGs, but the game’s strong narrative and real-time combat suggests it would have benefited from less of these tropes. Smoke and Sacrifice was developed by Solar Sail, published by Curve Digital and is available now on the PlayStation Store. A nicely designed Steampunk action adventure underpinned by an intriguing story line, Smoke and Sacrifice is hampered by repetitive world design, an excess of unnecessary crafting and a fighting mechanic which just isn't as much fun as it should be.